​March the 12th saw the Manchester Marathon training go to a new level ( for me at least )! 20 miles were looming in the form of the Runwales Marathon Festival. This was held in Wrexham and took the form of a half and full marathon with the addition of a 20 miler. Might as well get some bling for the training I thought so signed up. Steve and I were the only Wrekin contingent running.. but we bumped into a host of friendly Lawley folk so there were some familiar faces to chat to. After watching the forecast all week nerves were setting in at the prospect of running my first ever 20 miles in the rain. Now fair weather runners were arent if you'd seen what we trained in the previous week. The day arrived with slight cloud and the prospect of sunny spells. After a steady drive to Wrexham and an easy number collection we made our way to the start. The start / finish was well positioned in the centre of town close to coffee shops etc which had opened early to cater for runners..it seemed well organised too. 9am saw the start and as we set off all the nerves disappeared. I wasnt sure really how to deal with a 20 mile race so just went with it. Wrexham 20 is much like the half and takes in much of the local roads,lanes and industrial estates.. even passing the cereal factory. Im sure i could smell frosties ! As we've all been training together, I stuck with Steve and we struck a good steady pace for the first half of the race. The race is by no means flat with some deceiving undulations. With in the hour the sun was out and we were roasting. A balmy 14 degrees after a winter of training was hard work.. The miles ticked by and we were still going strong. The pace slowed slightly for the second half and a bit of encouragement in both directions saw us hit 18 miles. Not far to go.. just keep rolling. I was in unknown territory now although i felt pretty good. The last mile consisted of some sneaky uphill into the town. Realising how well we'd gone and that we were on for a good time we pushed the last little bit for a great finish. Nice medal and t shirt as well ! Not as nice as a well earned cuppa and cake afterwards.. Well who doesnt run to eat cake ?? After attempting two different ultra-marathons and unfortunately failing to make the distance could this be third time lucky? It was an early start meeting Paul at 5:20am to drive to Burton-upon-Trent to register and collect our numbers and then board a bus back to Newport. As we neared Newport the rain set in. ​The bus dropped us off at the main bus stop in the car park where we had a quick briefing. It was explained that the route had been amended due to flooding. It was good to see experienced ultra-runners Jon and Sarah Aston at the start. 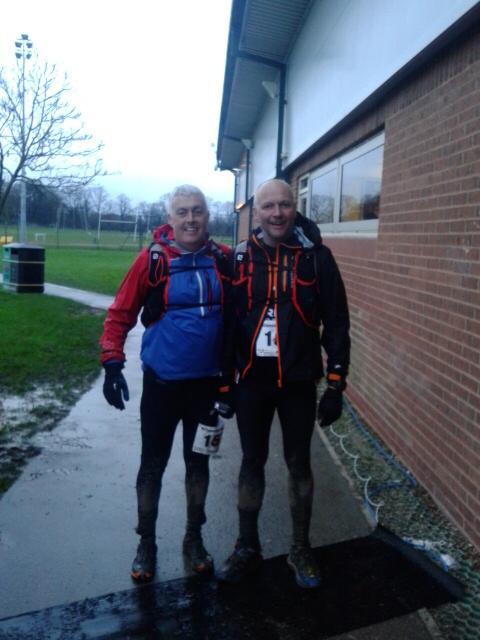 We set off in pouring rain – Alistair Potter from Lawley Running Club who was just out on a training run on the old railway line kept Paul and I company for the first 10 miles. Alistair had done the race the year before and gave us some valuable advice. Paul’s race plan was for us to do 10.30 minute mile pace but as those of you who know us know that we’re not great at keeping to pace and it was of little surprise to see that when we completed the 10 miles to Stafford we had averaged 9.30 minute mile pace. As we got in to Stafford and through the first check point it gave us an insight in to how muddy and wet this race was going to be. We grabbed a few crisps and nuts at the feed station and then we met up with Jon and Sarah. Paul and I agreed that if we kept up with Jon and Sarah Aston’s pace we might be in trouble later on in the race so we slowed a little. We ran along the canal path in Stafford and remained on this for the next 10 miles. The further we went the muddier it got. As we reached the half way point in 3 hours our pacing was way off. We both felt good and were told that we were in the top 30. We got a bit over excited and started to think we might be able to complete the race in 7 – 7.5 hours. How wrong we were! We were informed by our fellow competitors that the second half of the race was where it got really wet and muddy. Something to look forward to! They were not wrong and the mud got thicker and thicker and was very cold. Our pace decreased dramatically! Finally we came off the canal path which was a relief to us both. The next 9 miles was through farmland. The relief was very short lived as the fields were even muddier and more flooded. The run walk strategy had to kick in. Climbing over stiles and fences proved tiring. The constant running through mud took its toll and we both realised that there was no way we were going to finish in 7.5 hours. Paul picked up a foot injury which seemed to ease as he loosened off his laces. Unfortunately it wasn’t just a case of tight laces and Paul had to battle through agony in the latter stages of the race. As we approached the last check point and food station we were informed that we had just 10k to go. We were told that it would seem like the longest 10k we had ever run and they were right! It was back along the canal path. We were both suffering with tired legs after all the mud and from being on our feet for 8 hours. Finally my watch clocked up 41 miles but there was no sign of the finish and I had a sense of humour failure especially as we had to climb some steps which is the last thing I needed. Thankfully at the top of the steps we could see the Leisure Centre and the finish line. It’s amazing what the thought of people taking photographs does and I suddenly found some energy for a last push over the finish line. It was a huge relief to finish. A huge thank you to Paul for his wit and banter which helped get me through all 9 hours and 16 minutes of the wettest and muddiest race I have ever done. Huge respect to Jon and Sarah who make this type of event look easy (it is not!). They finished over an hour ahead of us and Sarah was third lady – just brilliant. 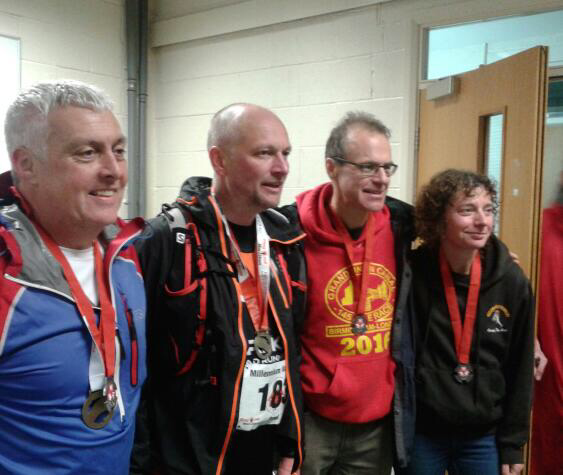 We headed inside to collect our medals – we each got two medals – one for completing the Millennium Way and one for completing our first ultra. Someone asked if I’d like to do the reverse route in a couple of weeks. I politely declined as I am doing Manchester Marathon to which Jon said “you can do both!”. I first did this race 3 years ago and always said I go back. 10k has never really been my thing, surprise, surprise, but it was billed as flat and very fast. The 1st time I travelled on my own saw a few familiar faces, mainly from TAC but the lovely Kathy and Jan were also there. This year was similar. However no Kathy or Jan , I bet they were running or marshalling another event. Anyway, concentrating on 13.1 this year and entered again just to see if my running was Improving or at least consistent. A few weeks to go and I invited my running pal Esther to join me and she was happy to. I was delighted. I picked Esther up at 8:30. It's not actually that far but they had warned that it had become popular as most races these days and It is only a small village. We arrive in plenty of time, parked in the designated field, only 100 yards from the start, and we had time to pop to the loo a couple of times ( some of them were miniature size to many ladies amusement) and walk part of the course twice as our warm up! The race starts of in a lane and goes round the village twice and is mainly in country lanes. The rain held off and the sun came out. So as we waited to get going we interrupted someone's conversation, as you do and then we were off. Normally I would be chasing Esther at these events but her training was a little lacking so we had decided that we probably would run solo. I was aware of a guy from the club running however I never spotted him. And we were off, other runners had friends and family cheering on so for a smaller event it was well supported. My first 2 kilometres were on pace and they I slowed down a little. I had some niggles in the week and decided to run in new trainers, my poorly leg behaved, my massages and calf guards had done the trick therefore I wasn't too happy when my good leg decided to hurt at 4K?? I slowed up but as I'm not one to start and not finish (often) decided to run through the pain. Sorry. However it paid off as by 8k phew, I didn't want another disaster so early on in the season. Anyway by this time I've passed the halfway which takes you passed the Race HQ again with the water station. All marshals were friendly and there were plenty of photographers. Well my first race of the year, a nice flat, 2-loop 10km around the picturesque village of Fradley. I set my PB here last year, but nowhere near that shape after a frustrating winter of constant injuries and niggles. All problems ‘hopefully’ behind me, I was really looking forward to setting a decent marker for the rest of the year. It’s a well organised event, but I would advise getting there in plenty of time as it is only a small village, so parking can take time. Preparations done, and after a short walk to the start, we were off! As always I started off too quick, but why make things easy! First lap completed, and we were greeted by the crowds and water station, and off for the final 5Km. The last two miles were tough, but managed to keep a decent pace, and finished in 47:22 -Reasonably pleased with my time, and more importantly no injuries!! 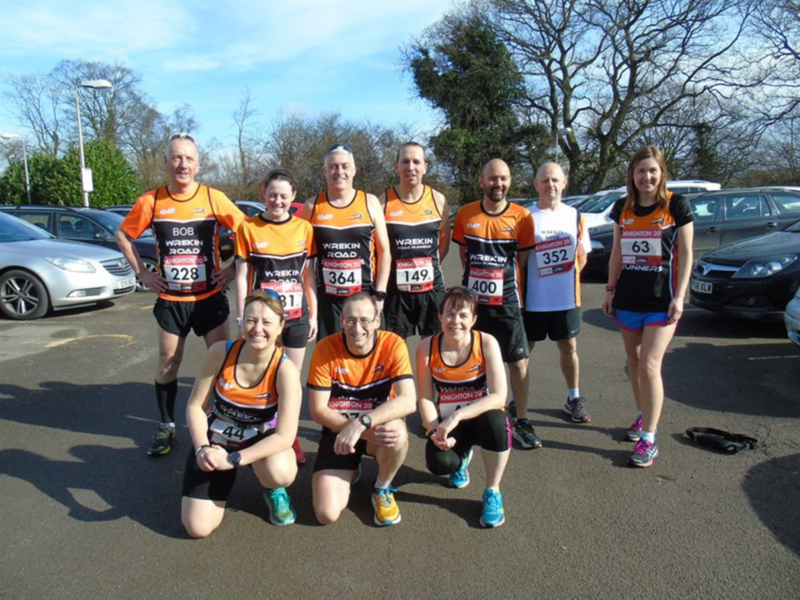 Two other Wrekin Road Runners were there too… Donna Howells finished in 52:29 (which I believe was a PB), and Esther Whitten finished in 56:41. Well done both. This really is a lovely race, and would recommend it to anyone looking for a PB, as I don’t think you’ll find too many flatter than this!! Like most people I was using this as a race/training run for a Marathon that was hurtling towards me like a runaway train. Knighton is just north of Newport and from what I saw consisted of a few houses, a social club with a football pitch and a great big factory next door. Not the most exciting places for a race to be honest. 10 intrepid WRR warriers turned up to race/train. This race consisted of three (yes three) laps. I am not fond of laps but I thought this would again be a mental challenge as well as the physical one. After collection of t-shirt, customary toilet visit and team photo we were ready to go. I started off with Robert Wilson doing just under 9 min pace for the first five miles and then Bob’s week away sking, eating and drinking caught up with him and he told me to go on. I then upped the pace and started to pass a few. As we passed the end of the first lap our wonderful supporters were there to cheers us on ( it really does give you a lift ). Around we went again ticking off the mile markers one by one. At approx 12/13 the giraffe of a man that lead the race came bounding along past me to my horror and awe of how easy he made it look. He finished in a sprightly 1.47 – gulp. Past the supporters for the 2nd time and on to the third and final lap. By this time you knew that the beginning of the lap was down hill, and there after it was undulating boarding on up hill most of the way. I had only ran up to 16 prior to this (please don’t tell my coach) so anything after 16 was an unknown. I struggled along but kept on reminding myself to keep upright and keep your form, it did work for me as I kept on going and still passed a number of other runners along the way ( a great mental boost ). I also used the approach of hitting 17 miles and thinking of only a parkrun left, then its only two miles and finally one mile, that’s 8/9 mins of running and yourdone. At last the finish was in sight and grateful I was to see it. Stopped my garmin at 2.44 with an average of 8.14min per mile. Looked down and it said 19.99 miles. Oh well nearly 20 miles but who gives a s—t. Not a bad race in all as serves a purpose and only £15 with a t-shirt. Great running by all but would I do it again? Not sure to be truthful but would recommend to all as part of their training at least once in your life.